Mizuma Art Gallery is pleased to present Akino Kondoh’s first solo exhibition “Ladybirds’ Requiem”. Born in 1980, Kondoh has received the Encouragement Award at the 2nd AX Newcomer’s Award (Seirin Kogeisha Co., Ltd.) for her manga work “Kayoko Kobayashi” in 2002, and Grand Prize at NHK Digista Award, Animation Division with her animation work “The Evening Traveling” in which a girl dances rhythmically to an unique music by Toshiaki Chiku (a former member of Japanese underground band called Tama) in 2002. She is regarded as one of the young artist who has been receiving great recognition in both domestic and international art scene. 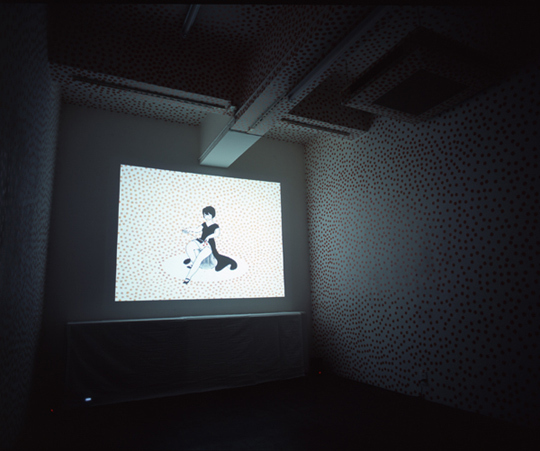 The title of this exhibition “Ladybirds’ Requiem” is also a title of her new animation work. This work is a remake of her graduation project as she was not satisfied with its result. The story of the animation begins from a girl mistakenly killing two ladybirds. From this incident, the girl’s guilt swells up to create an illusion of seeing a button of her blouse as ladybirds, and fears for a feeling towards an existence of numerous selves in some other places. Being submerged in such continuous wave of guilt and fear, she keeps sewing hundreds of buttons to inside of her skirt. The Girl is named “Eriko”, and she appears in all of Kondoh’s works such as manga or drawings as her ideal girl. The scene of Eiko dozing in the water or the sticky liquid oozing out from entwined ladybirds suggestively captures the psychology of adolescent young girl. Kondoh remembers about how she kept watching “Minna no uta” (NHK children’s music TV program), although she was frighten of recurring images of “The Metropolitan Museum of Art” in the program, how she had repetitive nightmares, a bitter taste of yellow fluid from joints of a ladybird or a ladybird getting killed by a car at the instant it fell out of one’s hand to the ground. This animation is created from her realization of these childhood nightmare-like experiences becoming beautiful and nostalgic memories as she grows, and how it became a source of her creative activities. 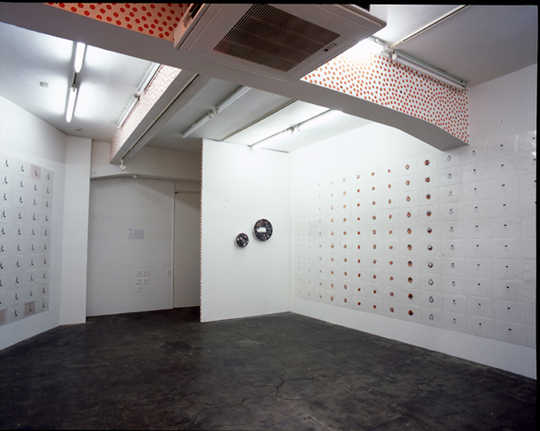 Through Kondoh’s works the audiences shall experience nostalgic and a border between uncertain reality and fantasy like a forgotten nightmare unconsciously we remember like a skin sensation. Also, the various scenes that were　not expressed within the animation will be exhibited as drawings. 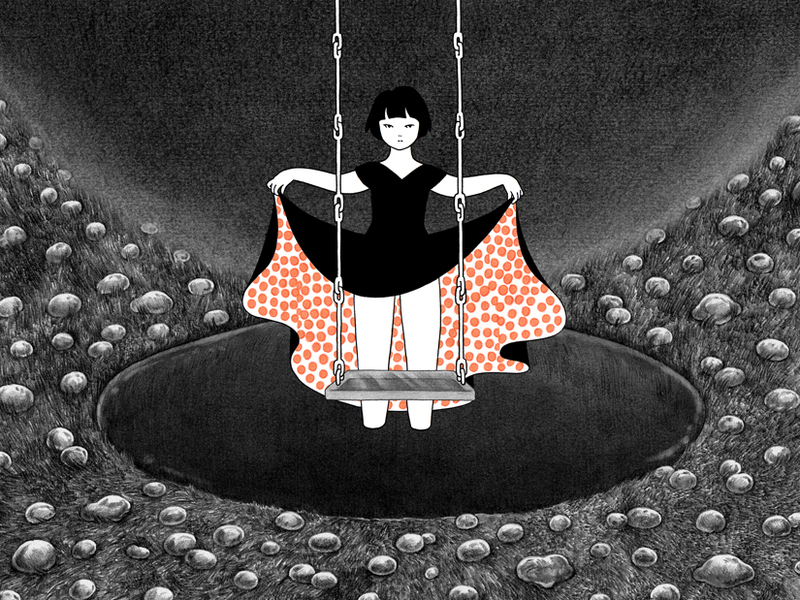 Akino Kondoh captures intangible memories and fantasies with a hint of enigmatic reality. We hope you enjoy Kondoh’s world that provokes the sense of fear and beauty of their childhood.